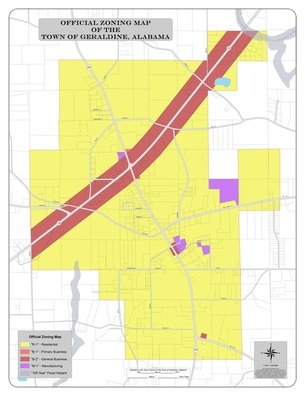 Geraldine's zoning ordinance governs all aspects of development within the town limits both commercial and residential. This includes but is not limited to construction of a structure, remodeling, installing or placing signs and animals.. A building permit is required for any type of new construction or remodeling. You must submit the appropriate form to the clerk's office. The Geraldine Planning Commission will meet to review your request and make their recommendation. In some instances, a public hearing is necessary. They will then make their recommendation to the Council. The Council will meet and make the final determination. Due to State of Alabama posting laws and open meeting act regulations, this process does require a considerable amount of time. For this reason, we suggest your submit your application as soon as possible. Mobile Homes are not allowed within the town limits without an exception granted from the Planning Commission. You must submit the appropriate form.